Ministry of Defence/Twitter/Business InsiderGCHQ’s distinctive ‘doughnut’ headquarters in Cheltenham, England. GCHQ, the UK listening and code-breaking agency, tweeted a cryptic message made of emoji this week . The message, for those who could crack it, was an announcement of a new puzzle book. The emoji message was a light-hearted change from the serious code-cracking which is GCHQ’s specialism. Scroll down to see the puzzle, and the answer. 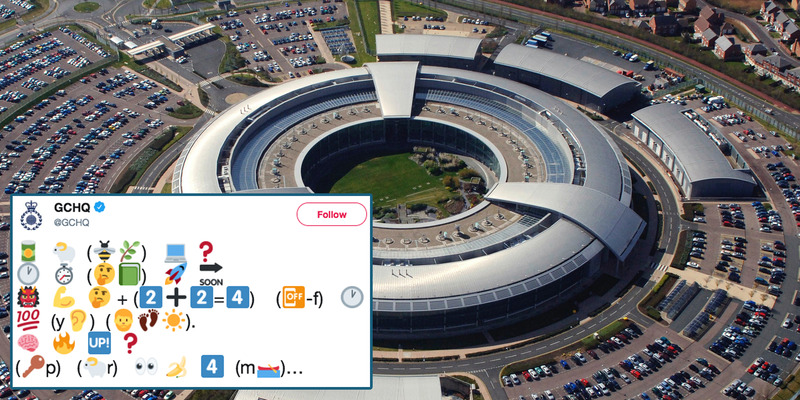 GCHQ is releasing a new puzzle book, and teased its arrival with an emoji puzzle on Twitter. The listening and code-breaking agency, one of the country’s most secretive organisations, tweeted the puzzle on Thursday, inviting puzzle fans and code crackers to give it their best effort. ???? ⏱ (????????) ???? ???? ???? ???? ???? + (2️⃣➕2️⃣=4️⃣) (??? ?-f) ???? ???? (y????) (????????☀️). The solution is a pretty straightforward one – by reading aloud what each of emoji represents, you get a few sentences announcing the new book. Which, in plain English, is: Can you believe it? Our second puzzle book is launching soon. Devilishly hard puzzles, plus some of our 100-year history. Brain fired up? Keeep your eyes peeled for more…. The book will be the security agency’s second, following its surprise hit “The GCHQ Puzzle Book” in 2016, which sold more than 300,000 copies. The new book will include real-life entrance tests from the organisation’s archives as well as an “even harder” section for puzzle experts when released in October 2018, according to publisher Penguin Random House. The book will be part of a series of events marking 100 years since the organisation was founded in 1919, and will include stories, facts, and photos from the organisation’s history. Proceeds from the book will go to charity, as they did with the first book, UK newspaper The Guardian reports. GCHQ uses puzzles to recruit aspiring spies – like this one that was broadcast on the radio to entice recruits. The agency was concealed for much of its history, and its existence was publicly revealed by journalists in the 1970s. Its existence was only formally acknowledged by the government in the 1990s. It was responsible for breaking the German Enigma codes in WWII but was at the center of the international debate about mass surveillance when whistleblower Edward Snowden revealed in 2013 that the agency collected all online and telephone data in the UK.